There has been controversy abound over the last few days over the decision of a 6 men to take part in the WSOP Ladies Event. Amongst these was well known pro, Shaun Deeb, who played until the first break in drag. 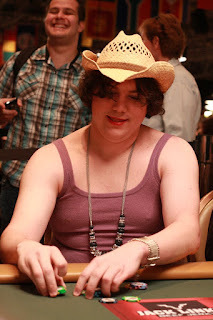 The WSOP isn't allowed to prevent men from entering the ladies event as it would contravene discrimination law. Personally I think that the Ladies Events are a good thing and the men certainly shouldn't have stooped so low as to enter the event. What's wrong with letting the ladies have the occasional exclusive event? Women take up such a small percentage of the average tournament field (5-10%), I think these events are a good thing for chicks who want to take some intimidation out of the game if they haven't played much live poker, or even just for the social side of things, I mean they have to put up with us leery, loudmouth guys the rest of the time, right? I do have to admit those guys have some balls though, I mean who would want to sit on a table with 8 women all pissed off at you for intruding on their event (unless they were particularly hot and it was worth it obviously). I hope none of them entered to try and prove a point about 'equality' or 'mens rights', because I just don't see how that applies here. Perhaps if the WSOP added extra prize money to this event, and no other event, they might have some kind of point. Otherwise it just seems dumb. I thought the argument that these guys potentially entered because of the equity in the event was perhaps a good one, I imagine that event is soffffffttttt...but then again probably no softer than the $1k and $1.5k NLH donkaments. Congrats to James Dempsey for taking 2nd in WSOP Event #25 ($10k PLO8 tournament). After winning a bracelet in Event #9 ($1.5k PLH), he's currently the front runner for the Player of the Series race. Sick man! Wp Flushy! I've hit the milestone of 100,000 hands over the last 3 weeks, over 13 days of play. Today's session ended in me doing a little dance as I won back to back $3-rebuy-180-mans in the last two tournaments I had open (wiiiii). I'm running around +$1.5million above EV, so I am due some major pain to make up for my run good over the last couple of sessions. 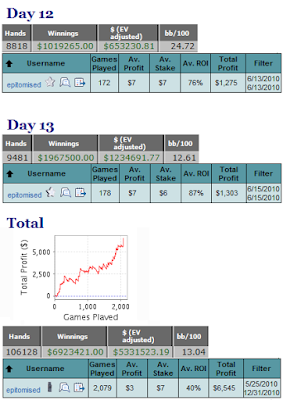 0 Comment to "Men playing in the Ladies Event & 100,000 hands in 3 weeks (+ SNQ Days 12 & 13)"